Games Like Terraria: Explore, Craft and Fight '+g+"
Terraria is a 2D side-scrolling action-packed, sandbox adventure game developed by game studio Re-Logic. It is an open-ended game which allows the players to build, fight, and explore the randomly generated 2D worlds. Check out these popular games that are similar to Terraria where you can explore, craft, build and fight. Our list of recommendations includes games like Terraria for PC, Mac, Linux, Android, iOS and many more consoles. Also don't forget to mention if we missed out on any other games as we keep on updating this list. Starbound is a 2D side-scrolling space adventure currently in beta developed by Chucklefish Games. The game begins with the player running away from his planet in a spaceship and crash lands on an unexplored planet. Players will travel from planet to planet exploring 2D procedurally generated worlds, crafting weapons, fighting different kinds of enemies. The game is available as early beta release on Steam. Minecraft is a 3D survival sandbox game and many feel Terraria as a 2D Minecraft game so this list would be incomplete without it. Terraria is very similar to Minecraft with the difference of it being an 2D game an its emphasis of action where as Minecraft is an 3D game that emphasis mostly on crafting and exploration. Minecraft is a popular game that is present in almost all platforms and consoles like PC, Mac, Linux, PS3, PS4, Xbox 360, Xbox One, Android, Windows Phone, iPad, iPhone and many more. King Arthur's Gold is another 2D side-scrolling multiplayer action platformer like Terraria that emphasis mostly on player versus player(PVP) battles as they compete to collect as much gold as possible. King Arthur's Gold is available on PC, Mac and Linux. Junk Jack X is an 2D side scrolling multiplayer sandbox game developed by PixBits. In the randomly generated world the player has to explore, craft, build and survive. 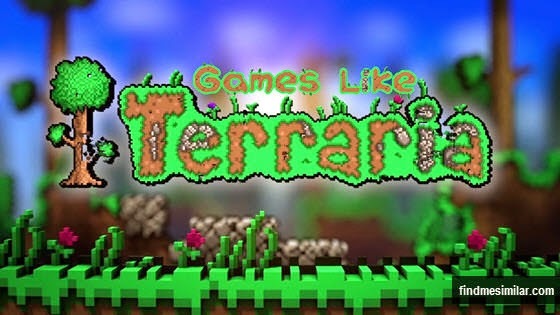 This is the best Sandbox game like on Terraria for iPhone and iPad. The Blockheads is a 2D Minecraft style side-scrolling sandbox game developed by Majic Jungle for iOS and Android devices. The game offers multiplayer game play which helps you to explore, dig, craft and build this vast world with your friends. Block Story,..think of any more games that should be on this list? then don't forget to mention it in the comments below.